This is for our guests who are serious about slimming. There is no crash diet involved. No quick fix. So expect a minimum stay of 14 days, and better still if you can invest a 21-day stay in your health and appearance. 14 Days/ 13 Nights. Single Occupancy. 1300 euro. Taxes extra. Double Occupancy. 1150 euro p.p. sharing. Taxes extra. 21 Days/ 20 Nights. Single Occupancy. 2100 euro. Taxes extra. Double Occupancy. 2000 euro p.p. sharing. Taxes extra. Come to Raheem Residency for our new discounted Weight - Loss package. Available for a limited period of time only. Deluxe Room, Ayurvedic Diet (3 meals per day), Consultation with the Ayurvedic doctor, Ayurvedic Treatments twice daily. 2 Hr country boat cruise down Kerala’s beautiful backwaters. 7 Days/ 6 Nights. Single Occupancy. 600 euro. Taxes extra. Double Occupancy. 650 euro p.p. sharing. Taxes extra. 14 Days/ 13 Nights. Single Occupancy. 1200 euro. Taxes extra. 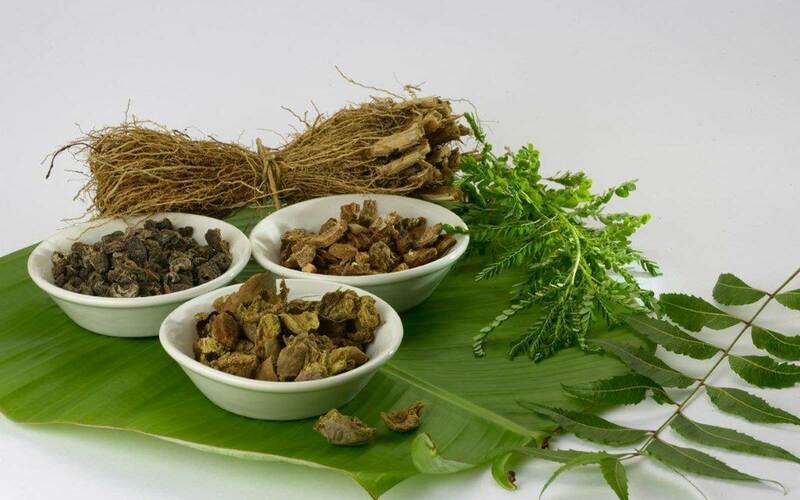 Rejuvenate body and mind with our specially discounted package that includes specific Ayurvedic treatments geared towards calming a busy mind, renewing lost energy, toning the skin and increasing relaxation. Come to Raheem Residency for our new discounted Rejuvenation package. Available for a limited period of time only. 7 Days/ 6 Nights. Single Occupancy. 499 euro. Taxes extra. Double Occupancy. 475 euro p.p. sharing. Taxes extra. Do you need to unwind, body and mind? Is your mind racing back and forth instead of staying in the present moment? Do you wake up at four in the morning with problems on your mind? Is it taking a toll on your body? Come to Raheem Residency for our new discounted Anti-Stress package. Available for a limited period of time only. Deluxe Room, Ayurvedic Diet (3 meals per day), Consultation with the Ayurvedic doctor, Ayurvedic Treatments daily &Yoga daily. NOTE: This stress-relieving package includes the powerful Shirodhara treatment for insomnia, mental tension and memory loss. Available April 1st-September 30th only. Three days of twice-daily massage will increase your energy levels, rejuvenate the body and mind, break up fatty deposits, create a more youthful vital appearance, tone the body and soften the skin. These treatments are recommended for both men and women. EXTRA: An optional Ayurvedic Face Pack may be included. Cost: 10 euro extra. Facials are very popular with men in India. So don’t be shy, Sir! Yoga classes in the morning. Cost: 10 euro each in a group OR 20 euro for one-to-one session. Six days of twice-daily massage will increase your energy levels, rejuvenate the body and mind, break up fatty deposits, create a more youthful vital appearance, tone the body and soften the skin. These treatments are recommended for both men and women. Evening Facial: An herbal facial cleanser and toner which nourish and revitalizes the skin, improves the skin texture and can slow down the onset of wrinkles. 60 minutes. Evening Pizhichil: Special Ayurvedic oil bath where lukewarm herbal oil is applied in a rhythmic way. Good for arthritis, backache and nervous disorders. 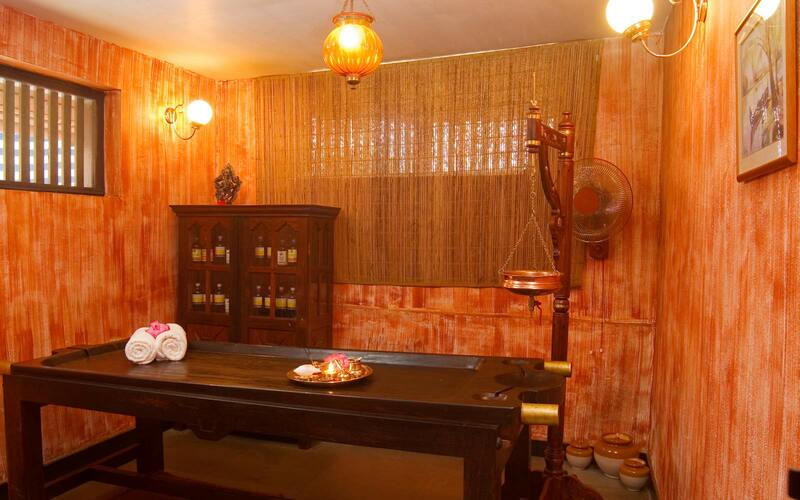 A truly luxurious Ayurvedic experience which includes a 20 minutes full body massage. Open Air Yoga classes in the morning. Cost: 10 euro each in a group OR 20 euro for one-to-one session.